The demand for certified nurses in the state of Alaska is high as compared to other states of USA. According to the Bureau of Labor Statistics, Alaska stands first in the top paying states list for this occupation. In May 2013, the state employed 2,110 CNAs and employment per 1,000 jobs was 6.55. The mean annual and hourly wages of these nurses were $35,440 and $17.04 respectively. As per the reports of indeed.com, the average salary of certified nurses in the state was $18,000 as of December 12, 2014. This figure was 26% lower than the average salary throughout the country. The table shown below gives detailed information about the wages of CNAs on different percentile brackets. The income of nursing assistants varies at different percentile levels. 90% of CNAs made less than $44,300 while 10% made more than $44,300. 75% of certified nurse assistants earned less than $38,760; the remaining 25% earned more than $38,760. 50% of the employees were salaried less than $35,120; the other 50% were salaried more than $35,120. 25% were paid annual wages less than $31,610; 75% were paid more than $31,610. 10% of employees were offered less than $27,620; 90% were offered more than $27,620. 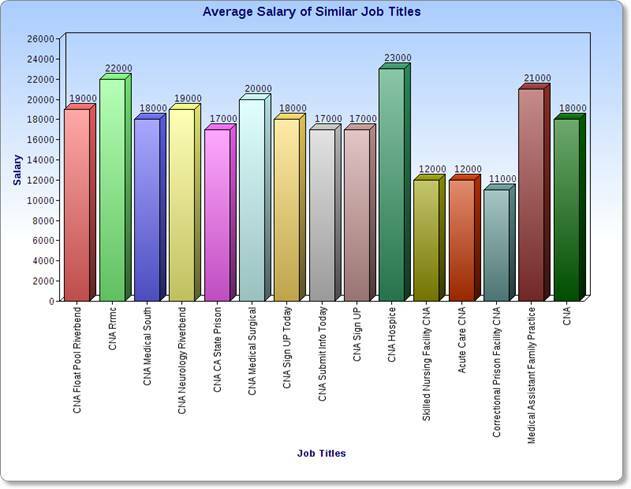 The salary of CNA varies within the different cities of AK. The city that offered the maximum salary for this job is Juneau with median annual and monthly salary of $30,167 and $2,514 respectively. It even provided the highest median weekly salary. Sitka was the city with the lowest paying scale. There is an extensive range of industries that you can work with in the state of Alaska. Your pay scale varies considerably depending upon your nursing work profile and experience. According to indeed.com, in December 5, 2014, CNA Hospice in Alaska earned the highest income, i.e., $23,000. On the other hand, Correctional Prison Facility CNA in Alaska was among the lowest earners with salary of $11,000. Due to the increasing demand of CNAs in Alaska, the need for care providers has exploded over the past several years. The state is counted among the top paying states since it employed 2,110 CNAs with an average Salary of $18,000 as per indeed.com. Question 1 – What are the best paying nursing assistant jobs in the state? Answer – As mentioned in the above table, CNA Hospice in Alaska (According to indeed.com, in December 5, 2014) earned the highest income, i.e., $23,000.